Similar to this question, but generalized to any mainframe computer from before the microprocessor era, does there exist an emulator and OS for a vintage mainframe computer that will run the output from a working FORTRAN compiler, from FORTRAN source code written on a contemporary system. The goal is for a student to be able to write code in an early programming language version on a student's laptop (or Pi, etc., without the need for an actual noisy card punch); but then check that the resulting code might actually have run on an old mainframe by using a reasonably accurate emulator (prefer cycle accurate, but not absolutely necessary) and seeing the (emulated line printer or whatever) output. One possibility to look at might be the Hercules emulator, which emulates the IBM S/370, ESA/390, and z/Arch systems. This is emulating the 'bare iron', and does not include the operating system or utilities, but there are sources for OS images and compilers listed on that page. DEC PDP-8 running OS 8. Both of these ran under SimH on a Raspberry Pi Zero. The PDP-8, being a small machine, typically ran from paper tape rather than cards. I have reason to believe that another early educational computer, the IBM 1130 will run under SimH, or under the IBM1130.org simulator. IBM1130.org has a download package that includes a Fortran compiler. From correspondence with the author of A FORTRAN Coloring Book, it seems that the book was targeted to students submitting code on an 1130. I'm not sure if it's possible to run IBM FORTRAN H — the version that introduced COMPLEX — on an 1130, though. It's possible to compile Fortran-77 and older using gfortran -std=legacy …. What will really get you with old code, though, are the machine-specific assumptions. For example, the Coloring Book is peppered with // FOR, // JOB and // XEQ batch control cards with little explanation of what they do. It would have been assumed common knowledge for all users at the time. The Fortran character set is a simple subset of ASCII, but if you want to really emulate punch cards, you should look at Douglas W. Jones's punched card index. It has tools to convert ASCII ↔ EBCDIC for compiling card decks, and the format is used by SiMH. Does it have to be a mainframe, or PDP-11 or VAX would be good enough? If the latter, then there is SIMH, and there is Bitsavers' Software Archive. There was a FORTRAN compiler on BSD UNIX for sure. Better yet, there is no need to simulate the whole system. For convenience, one can use a user space PDP-11 emulator. Binaries can be taken from here, 2.11 BSD preferred. There are emulators for the historically significant systems produced by Control Data Corp. cdc and Cray cray. DtCYBER, which can be run on Windows and Linux and is available as source code under GPL 3.0 terms. DtCYBER does not include operating systems, compilers, etc., which the user must provide for themselves--a tall order, but probably not impossible. 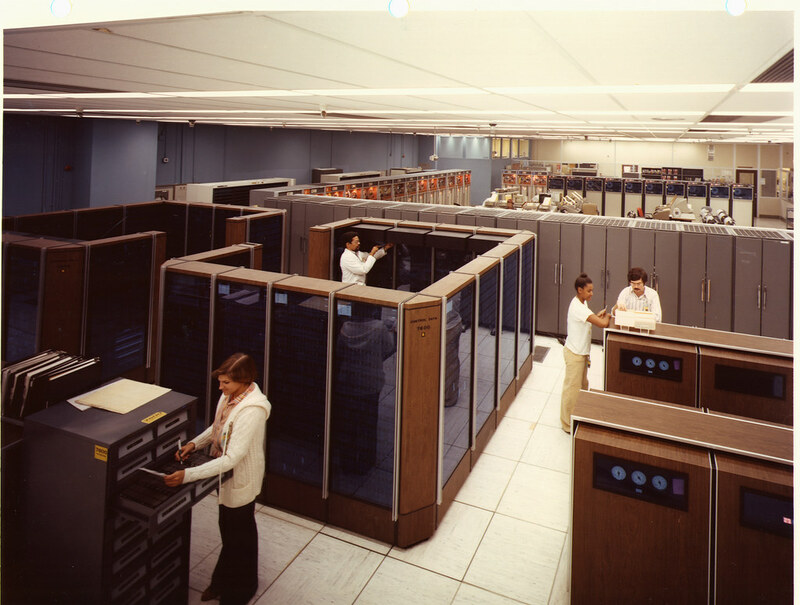 http://www.cray-cyber.org operates Internet-accessible CDC, Cray, and other historic mainframe and supercomputer-class systems, running their historic operating systems. These include an actual working instance of DtCYBER running CDC's NOS V2.8.7 operating system as well as its Fortran compiler FTN5. Living Computers operates a freely accessible CDC 6500 running NOS V1.3, in addition to Digital Equipment Corp.s mainframe DECSYSTEM-2065 (running tops-10 v7.04) and the desktop-sized xkl Toad-2 "mainframe", a 1990's era system built around a single-chip, radically enhanced implementation of the decsystem-20 processor architecture, running tops-20 V7.1. I haven't checked, but I imagine they all have FORTRAN. Beside the already mentiond Hercules emulation, why not using a real mainframe? The Gesellschaft für historische Rechenanlagen (Society for Historic Computing Machinery) in Munich does offer a free remote login to a (rather modern, 1988) Cray Y-MP. The Y-MP runs usually 24/7. On selected days, a CDC Cyber 960, the last iteration of the CDC6600 design, can be accessed. Both machines are equipped with stock FORTRAN compilers. So all you need is to upload your programms, compile and run it in a classic (well, 1980s) environment on a real machine. If needed, older OS Environments might also available (on the 960), but I'm not sure if they can be accessed over the internet. Number crunching in FORTRAN on a CDC is about as classic as it ever can get. I can imagine that they will also support you in using these machines for a reasonable sized course (donations are wellcome as all of this is payed out of their personal pockets). Now, with some pretty please, it's even possible to show up with a bundle of punch cards and have them run to get an output as punch cards and printouts on a classic line printer on green and white forms. Caveat: They are moving between different buildings, so I'm not sure about actual location and if conectivity is abailable at all. Just write a mail ( mail at cray-cyber.org ) to check whats possible. Not the answer you're looking for? Browse other questions tagged programming emulation compilers fortran or ask your own question.